When an elephant plants himself in the road and refuses to move, the people of Prickly Valley try all sorts of methods to get him to go-but one thoughtful little girl works up the courage to do what no one else has done: ask him. 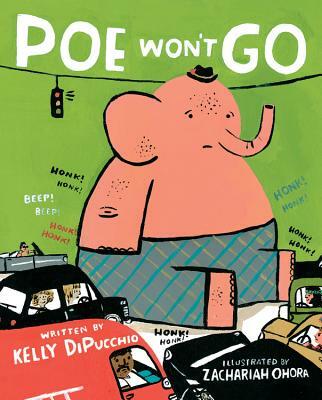 Balancing both hilarity and sensitivity, Poe Won't Go has the feel of a contemporary classic, reminding readers that there is power in one, power in listening, and power in being a friend. Kelly DiPucchio is the award-winning author of several children's books, including The Sandwich Swap, cowritten with Queen Rania Al Abdullah and illustrated by Tricia Tusa; the New York Times best-selling Grace for President, illustrated by LeUyen Pham; and Gaston, illustrated by Christian Robinson. Kelly lives with her family in southeastern Michigan and is fluent in both English and dog. She invites you to visit her website at kellydipucchio.com. Zachariah OHora is the illustrator of the New York Times best-selling book Wolfie the Bunny by Ame Dyckman, as well as The Teacher's Pet by Anica Mrose Rissi. He is the author and illustrator of a number of award-winning books, including The Huffington Post's Best Children's Book of 2013, No Fits, Nilson! and My Cousin Momo!, a Boston Globe Best Children's Book of 2015. He lives in Narberth, Pennsylvania, with his wife and two sons. Visit him online at zohora.com or on Twitter @ZachariahOHora.